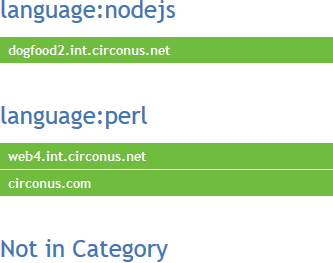 Ok, we know a lot of you have been asking for tags in Circonus for a long time. Well, they’re finally here! The tags feature is currently in beta, and will be released to all customers very soon. (Tags have actually been available to API users for a while, just without UI support in the application.) Let’s jump right in and I’ll give you a quick overview of how tags will work in Circonus. First Things First: What’s Taggable? For this initial implementation of tags, you can tag Graphs, Worksheets, Check Bundles, Templates, and Maintenance Windows. You will also see tags on some other pages, such as Alerts, Rulesets, Hosts, and Metrics, but these items aren’t taggable. The tags you see on those pages are inherited from the associated Check Bundles. In the near future, we’ll be adding to these lists. We are planning on making Annotations and Dashboards taggable, and have some other unique ways we’re planning on using tags to help categorize and group items in the UI. First, you’ll need to add tags to some items. All tags are categorized in the system, but if you don’t want to categorize your tags, that’s ok. Simply use the “uncategorized” category for all your tags and the tags will be presented solo (without category) throughout the UI. We have a couple of categories which are already created in the system, but you can create as many custom categories as you wish. Let’s go to one of the list pages containing taggable items (e.g. the Checks list page) and look for the tags toolbar under an item (it will have an outlined tag with a plus icon). Click the “+” tag to open the “Add Tag” dialog. First choose a category or use the “+ ADD Category” option to enter a new one, then the tags dropdown will be populated with the tags under that category. Choose a tag or enter a new one by choosing the “+ ADD Tag” option, then use the “Add Tag +” button to add the tag to the item. When the tag is added to the UI, you’ll notice right away that each tag category has its own color. There is a limited set of pre-selected colors which will be assigned to categories as they are created. These particular colors have been chosen to maximize your eye’s ability to distinguish the categories at a glance, and also because they work well under both light and dark icons. So you’ll also notice that the tag you added has its own icon. There’s a set of twelve icons which will be assigned to the first twelve tags in each category. Once a category has twelve tags, any further tags added to that category will receive blank icons. This system of colors and tags will create fairly unique combinations that should help you recognize tags at a glance without needing to read the tag every time. Note: taggable items can have unlimited tags. After you add a tag to an item, you’ll also notice that a small set of summary tags is added (usually off to the right of the item). This shows the first few tags on the item, providing a way for you to quickly scan down the page and get a glimpse of the tags that are assigned to each item on the page. One more note about tags and categories. Although you select them separately in the UI, when using the API the categories and tags are joined with a colon (“:”) as the separator. So a tag “windows” in the category of “os” would be represented as “os:windows” in the API. The power of tags is apparent once you start using tag filters. Look in the upper right corner of the page and you’ll see an outlined tag with a funnel icon and beside it a similar menu button. These are for setting tag filters and saving tag filter sets for easy application later. 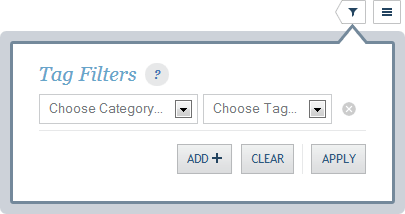 Click the funnel tag to open the “Tag Filters” dialog, and click the “Add +” button to add a filter to the dialog. You may add as many filters as you wish, and in each one all you have to do is choose a category and tag from the choices (you may not enter new tags or categories here; these are simply the tags you’ve already added to the system). Use the “x” buttons at the right to remove filters, or use the “Clear” button to remove all filters and start with a clean slate. Note: none of your changes in this dialog are applied until you click the “Apply” button. After clicking “Apply,” the page will refresh and you’ll see your newly applied filters at the top of the page. You can then use the “Tag Filters” dialog to change these filters, or you can use the menu button on the right to open the “Tag Filter Sets” dialog, where you may save & apply sets of tag filters for easy switching. 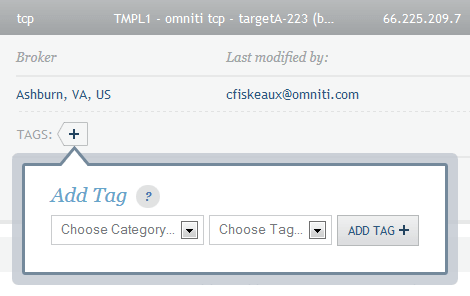 One important feature to note is the “sticky” checkbox that appears when you have one or more tag filters applied. By default (with “sticky” turned off), the tag filters you apply are only visible in the current tab. If you close the tab or open a new one, it will not retain the current tag filters. The benefit of this is that we’ve developed a system to allow you to have multiple concurrent tag filter views open side-by-side. So with the “sticky” setting off, you can open several tabs, use different tag filters in all of them, and each tab will retain its own tag filters as you navigate Circonus in that tab. If at any point you turn the “sticky” setting on, the tag filters from that tab will be applied universally and will override all the other tabs. And not only are “sticky” tag filters applied across all tabs, they’re remembered across all of your user sessions, so they will remain applied until you choose to change or remove them. One unique feature we’ve already completed is Host Grouping. Head on over to the Hosts page and open the “Layout Options” by clicking on the grid icon at the right side of the page. You’ll see a new option labeled “Group By Tag Category.” If you choose a tag category there, the page will reorganize itself. You’ll now see a subtitle for each tag in the selected category, and under each subtitle you’ll see the Hosts which have Check Bundles with that tag. Because each Host can have many tags, including more than one tag in the same category, you may see a Host appear in more than one group. At the bottom of the page you’ll also see a grouping subtitled “Not in Category.” Under this group you’ll see all the Hosts which don’t have any Check Bundles with tags in the chosen category.